In this week’s challenge, you will learn how to make a simple clean eating meal plan. Breakfast, lunch and dinner planning is an essential habit to save time and money while sticking to a fiber-rich clean eating diet. But don’t panic, we’ll start again with a mini step. I’ve also created a special weekly meal planner for you, that you can download for free. …too time-consuming, too challenging, too inconvenient, too expensive…Homemade meals seem to be a thing of the past for the majority of American families. On the other hand, the market for over processed foods is booming. Could one of the statements be from you? Do you hate cooking? Or are you too tired to cook healthy meals after work? The lack of home cooking is one of the major factors contributing to obesity! But what can you do now? It is true – homemade food takes time! On the other hand, cooking is one area in your life that you can easily keep under control. You just have to take a few simple, basic steps. If you want to eat clean and healthy, start to think about varied, tasty, nutritious meals in advance. Once your plan is in place, follow it! No need to be overly ambitious…Again, an 80/20 approach is more than enough! 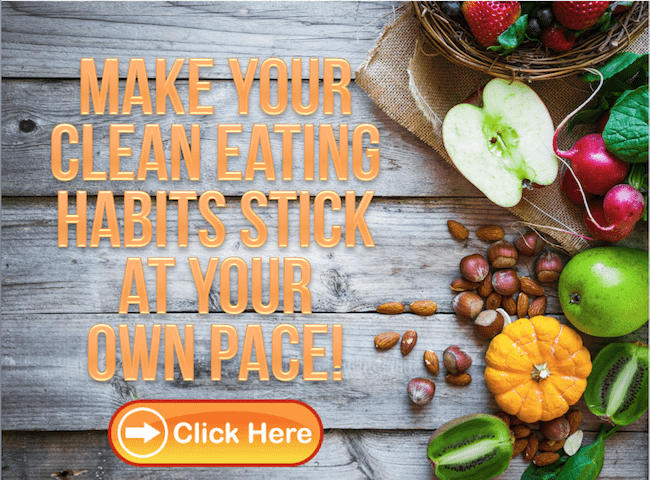 Keep in mind what you learned about clean eating; remember the foods you should (complex carbohydrates, lean protein, healthy fats) and shouldn’t be eating. I recommend a foresought at least a week at a time, especially if you like it keeping interesting with variety and experimenting. You always know what’s for dinner – no last-minute 5 pm craziness. While it’s easier to improvise with breakfast and lunch, dinner never falls into place by itself. That’s why the “Lean Jump Start” approach is to start by planning just dinner. 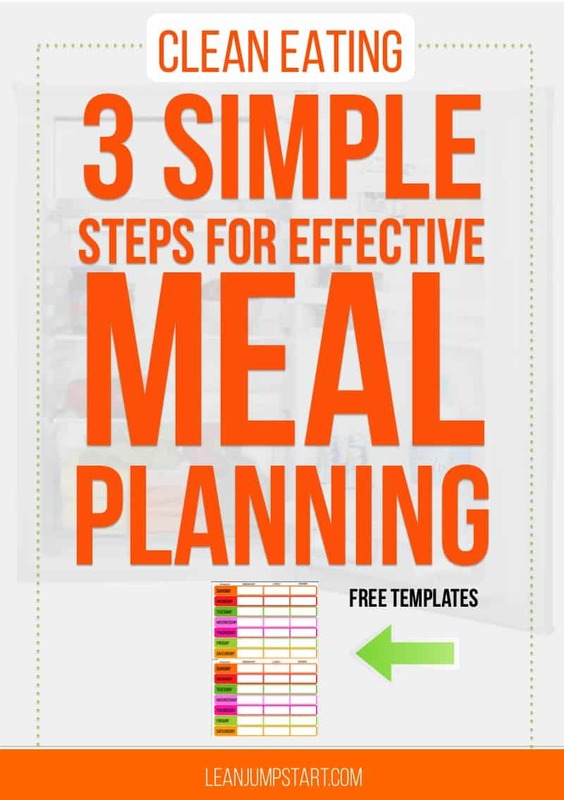 Below is a simple 3-step habit change that will help you automate your dinner planning. Set a timer for 5 (or 10) minutes. Write down a quick and rough dinner plan for the following week. Try to use up the food that’s already sitting in the pantry or fridge. Now, write down any ingredients you need for the dishes that you don’t already have in your home. I suggest you make your own customized shopping list. 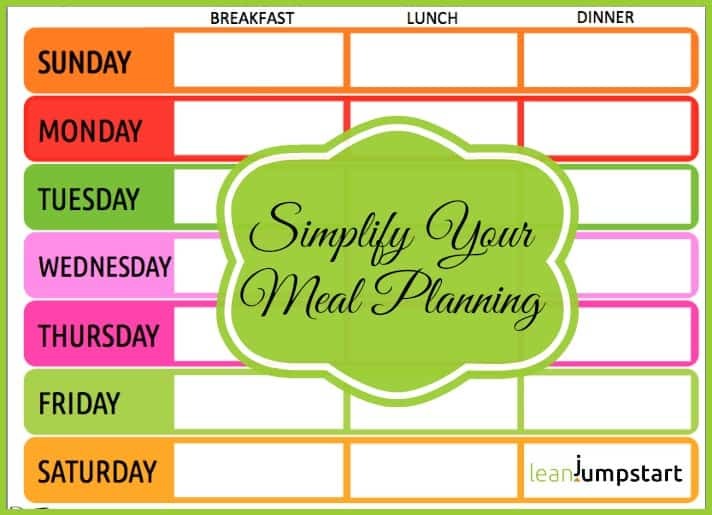 => Click here and you can download my simple weekly meal planner to get started! Once you get used to it, add in breakfast and lunch. Consult your family calendar first when you plan dinner. Busy evenings with sports or other activities will require a freezer meal or another quickly prepared dish. Try to repeat certain themes from one week to the next. You could have a whole grain dish every Monday and Mexican food every Wednesday. We have fish every Friday. A general theme can help you as an inspiring, rough guideline and still offer you enough room for many different variations. If you have kids, it’s a smart idea to have them choose something for the weekly planner. They will be more likely to try new foods and even more motivated in helping you prepare the dinner. Go shopping as seldom as possible but as often as necessary based on your customized shopping list. For most people, weekends are the best time for shopping. “Cut out shopping” is an important habit we will tackle in a future challenge. Try to make extra servings of whatever you’re having for dinner. You can then freeze the leftovers and integrate them in a future plan for days with a busy evening schedule. Another way to make sure delicious and healthy food is quickly available when you come home from work is to prepare food in advance. Make time on a weekend to cook a few dishes on your plan that will last well through the week. Part of the ingredients you might want to freeze. Having a well-stocked freezer is crucial if you want to eat a healthy diet. Take a fun approach and you’ll feel great! Think of your cooking and planning, not a chore but as an act of love for your family and your body. Take a fun approach that avoids a sense of drudgery right from the start. Turn on your favorite music and set the right mood. Don’t be shy: sing along with the music, while you cut and slice your ingredients. You may find that when you make cooking an activity that you do while relaxed and without pressure, you’ll start loving it. The more you cook, the more comfortable you’ll be. I will address “menu planning” in detail later, but with this simple jump-start approach, you’re already prepared to go a long way. You’ll put it to good use, won’t you? 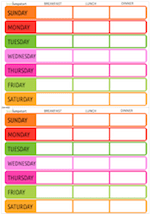 Could you put an example of your meal planning in this template? Just curious. Thanks! 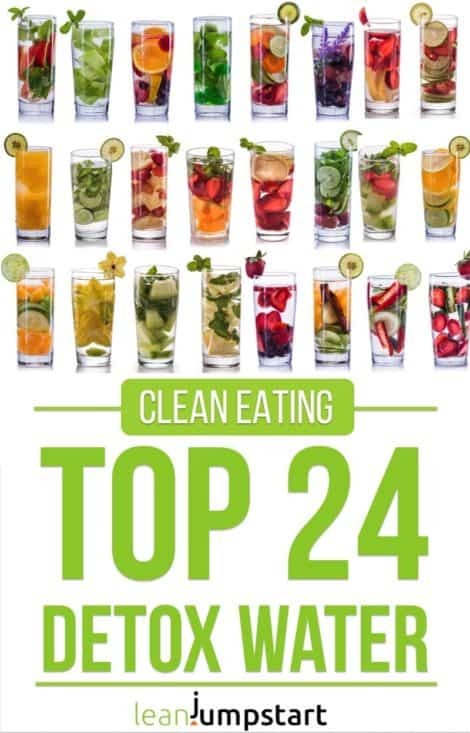 I’m planning to give examples in a future challenge (week 49) – where I’m giving tips on simplifying clean eating dinners. I hope you don’t mind waiting till then. All the best. Raj, I encourage you to give this simplified meal planning a try. BTW later in the year I will tackle also the challenge how to eat healthy when you travel a lot. Love the template. I started doing this about 9 months ago. It takes time to plan, but it saves more time and money than it takes. I set down every Friday night or Saturday morning and look at the week ahead, look at what we need to use up and plan my meals and shopping list according. I’m glad you love the template Dawn:) – I second everything you said and congratulate you for already “living” this healthy habit.